Home » Blog » What Are the Most Common Car Accident Injuries? When it comes to motor vehicle accidents, you can place your trust in attorney Geoffrey Dashner for expert legal advice. Dashner is well aware of the pain and suffering these violent collisions can cause. He has served countless victims of car accidents throughout the Dallas-Fort Worth Metroplex. Let’s take a look at some of the most common injuries suffered as a result of motor vehicle accidents. The National Highway Traffic Safety Administration reports that motor vehicle accidents cause over three million injuries each year in the United States. These injuries range from mild whiplash to paralysis and fatalities. Yet there are some types of injuries that are much more common than others. Such injuries happen at such a high frequency due to a variety of factors ranging from common angles of the collision, the deployment of airbags, and a number of other factors. Car accident injuries typically fit into two categories: impact injuries and penetrating injuries. Impact injuries occur when the vehicle occupant’s body comes into contact with a portion of the vehicle’s interior. An example of a common impact injury is a knee bashing against the dashboard. Another example is one’s head hitting the window or seat rest. Penetrating injuries are scrapes and cuts. These injuries are commonly caused by shattered glass or objects that fly through the car upon impact. Car accidents often result in soft tissue injuries to connective tissue like tendons, ligaments, and muscles. To the surprise of some, these soft tissue injuries are actually the most common car accident injury. Whiplash to the upper back and neck is one style of soft tissue injury. 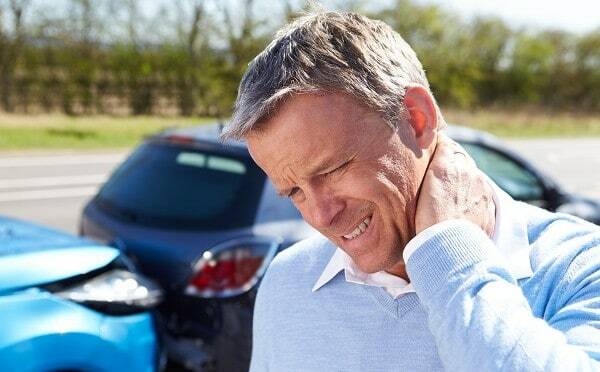 Whiplash is the extreme stretching of the ligaments and muscles along the head, neck or upper back. Such force can also result in soft tissue injuries in other sections of the body as well. Whiplash pain can even extend all the way down to the lower back. Head injuries are quite common in car accidents due to the proximity of the head to the vehicle’s windows, ceiling, headrest, steering wheel etc. Even the release of an airbag can cause a head injury such as a broken nose. However, you do not have to actually hit your head on something to suffer a closed head injury. A considerable number of auto accidents result in a side impact that harms the arms and legs. Oftentimes, the legs and arms are thrown against the door. Most cars have little space for the legs to move so knees commonly smash into seats or the dashboard during accidents. In some instances, these injuries are mere scrapes or bruises. Yet there is also the potential for sprains as well as breaks. Chest injuries in the form of bruises or contusions are also fairly common in car accidents. More severe chest injuries take the form of broken ribs and various internal injuries. This area of the body is commonly damaged due to the chest’s proximity to the steering wheel and dashboard. The chest area is also vulnerable due to the fact that seat belts often apply a significant level of force against this part of the body. Such harsh contact commonly causes significant bruising of the chest.